This Garrett Acentric DELUXE Gold Pan Kit features the new 14 inch Acentric Gold Pan and 9 additional pans and accessories— everything you need for gold panning. As the laste Charles Garrett used to say, "After purchasing a gold pan kit or metal detector, no further expenditures of cash are required. Success is limited only by the enterprise you display and your dreams as a prospector." 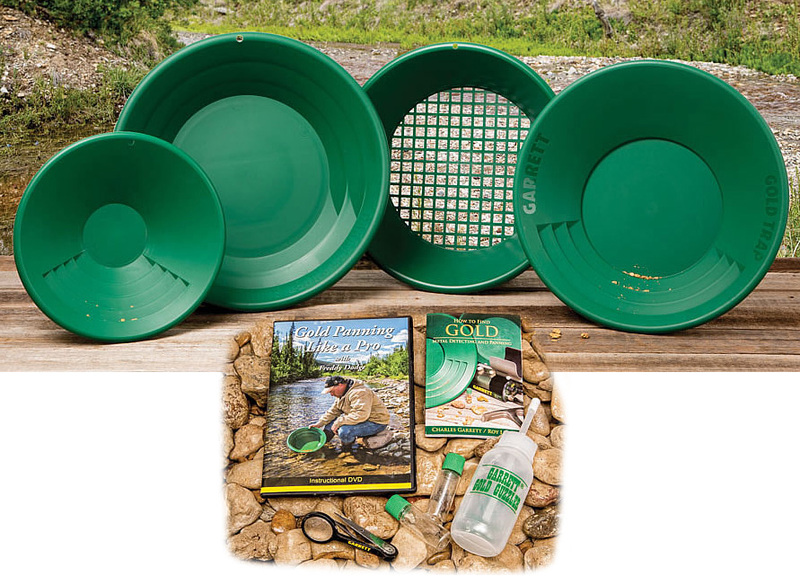 This kit also makes a great gift for someone you hope will catch Gold Fever! Why is the new patent-pending 14 inch Acentric Gold Pan so special? Exclusive 90 degree riffled design prevents gold from sloshing out of the pan. Ideal for dry panning, too! How to Find Gold: Metal Detecting and Panning by Charles Garrett and Roy Lagal is designed for use in the field (pocket sized 3.5" x 5"). It includes a glossary and illustrations. 72 pages. Gold Panning Like a Pro DVD features Freddy Dodge from the hit TV show Gold Rush. Freddy is a mining expert. He and his brother Derek Dodge, and their family have been prospecting, panning, and building mining equipment for decades.